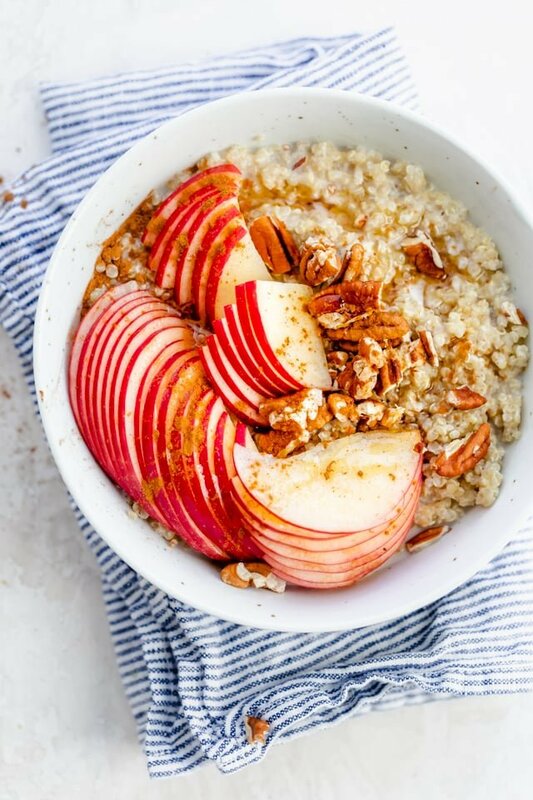 If you’re trying to get on the oatmeal train but just don’t like the consistency of cooked oats, give this quinoa oatmeal a try! 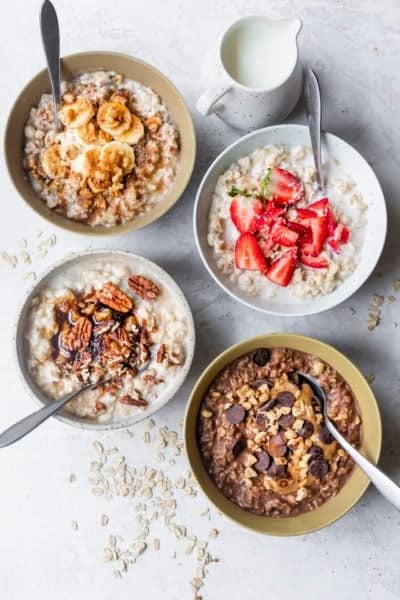 Instead of using rolled oats, I use quinoa and mix it with milk and sweetener to make a breakfast porridge that’s incredibly versatile, absolutely delicious and chock-full of nutrients and protein. 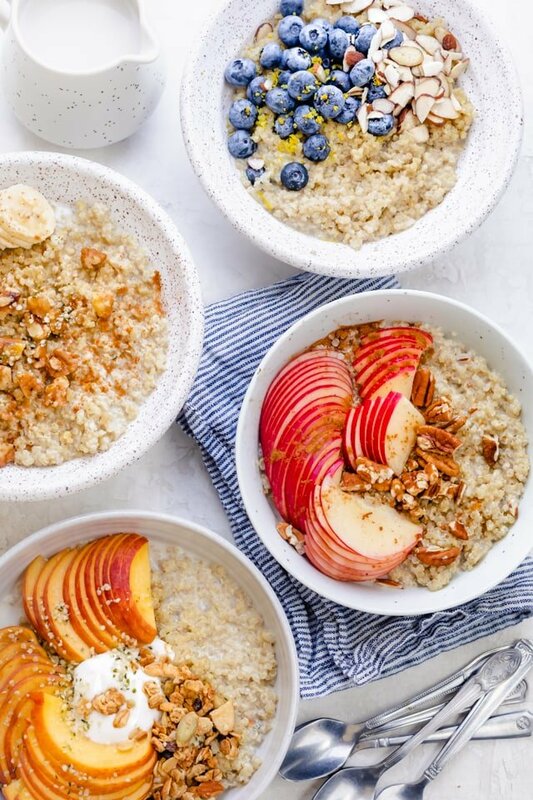 You can prepare this quinoa oatmeal in pretty much the same method you would prepare regular oatmeal. 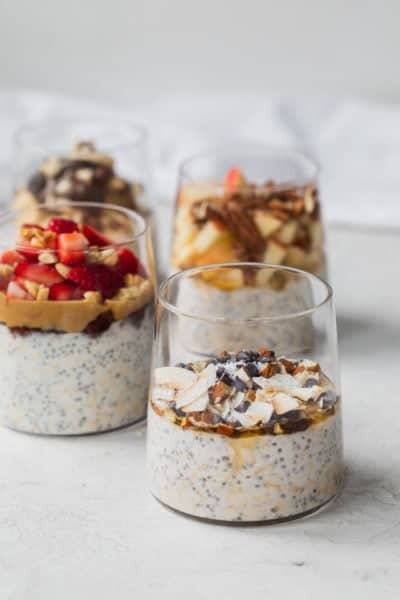 Quinoa is naturally gluten-free and the recipe is great if you’re on a plant-based diet, since it’s made with vegan milk and maple syrup, and can be dressed up with all types of fruits, nuts, seeds and spices. The first step is to rinse and drain the quinoa. 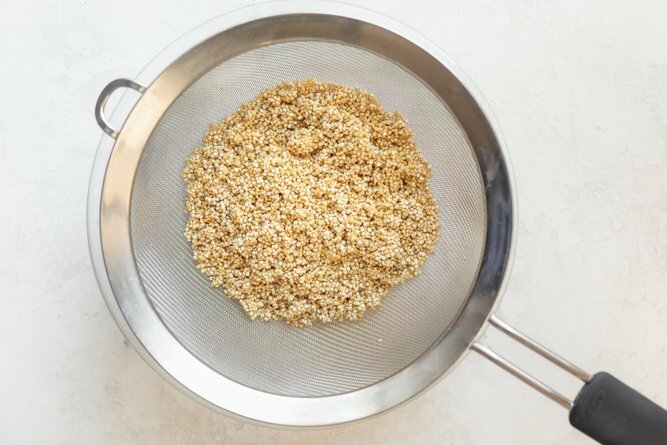 This step is crucial to remove the bitterness from the outside of the quinoa. Make sure the water runs clear, and you’ll know it’s ready. I prefer making the quinoa oatmeal on the stovetop because I can toast the quinoa before adding the liquid. 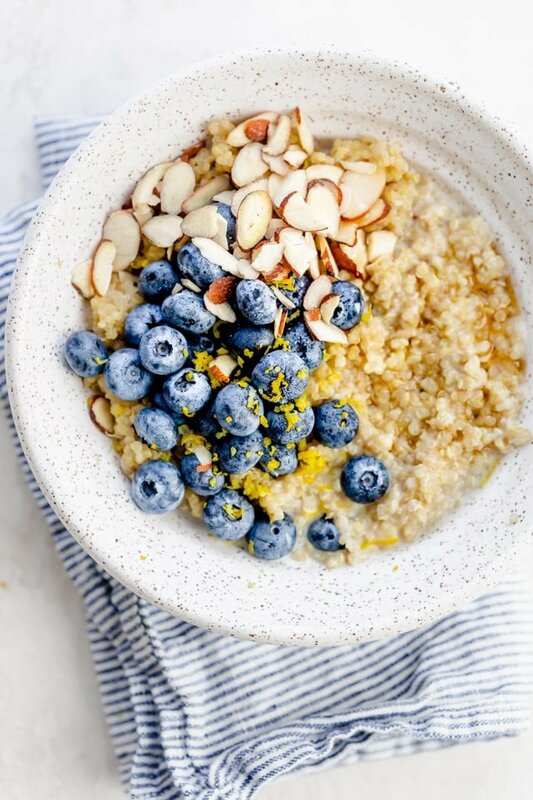 This gives the quinoa a nutty flavor which lends itself to a better breakfast bowl all together. And it’s really quite simple. You’ll start by toasting the quinoa until you hear popping noises or it starts to get darker in color. Then add the milk, sweetener and salt. 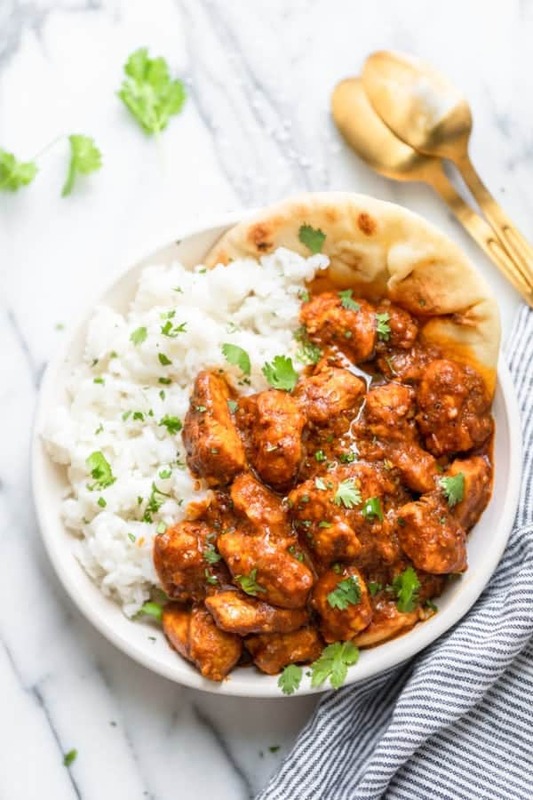 Here, you can also add any type of warm spices like cinnamon, nutmeg, cardamom, ginger and/or turmeric. 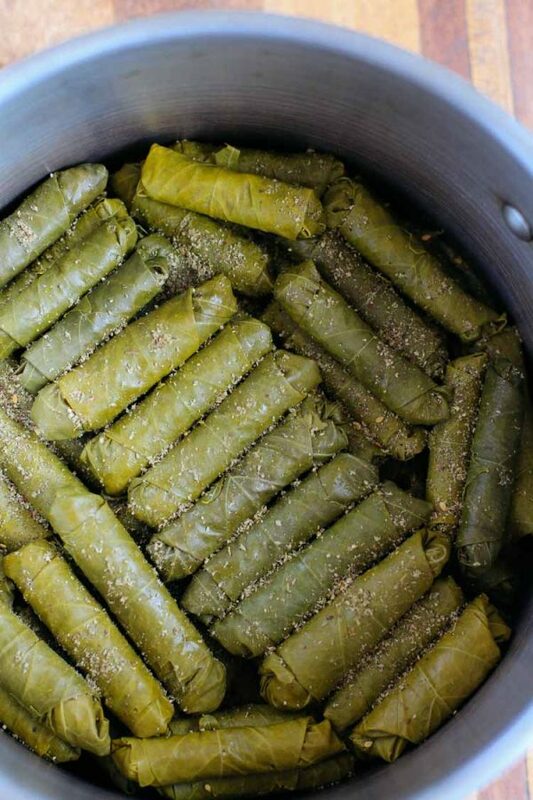 Cover and let it cook for 15 minutes. Then remove from heat to allow the liquid to absorb, and fluff with a fork. It’s pretty much the same process as cooking savory quinoa, only we’re using milk and sweetener. 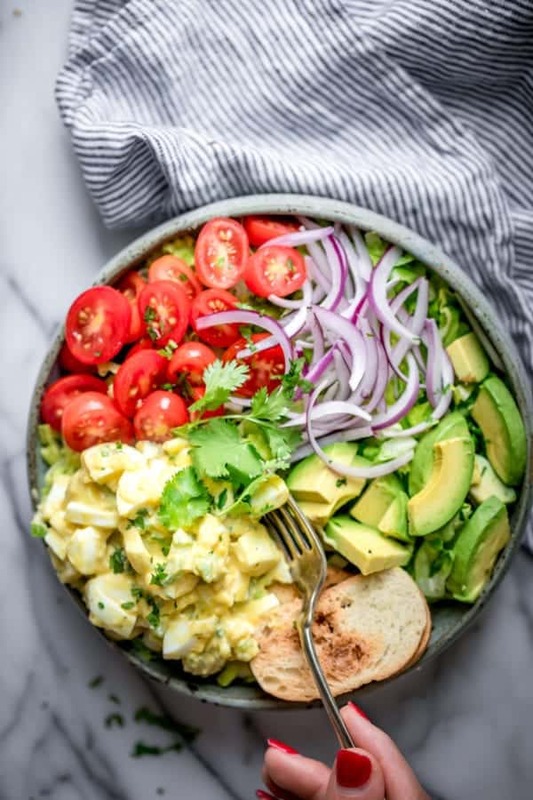 You can also make this quinoa breakfast bowl in the microwave. Make 4 servings per my instructions or just one serving using 1/4 cup of quinoa. The process here is to put everything together in a large microwave-safe bowl, then microwaving for 6 minutes, stirring and microwaving again for 3 minutes. Just like the stovetop instructions, you’ll want to let the quinoa rest covered for 5 minutes on the countertop so the quinoa absorbs all the liquid before fluffing. Fruits: Fresh fruits, dried fruits, freeze-dried fruits, frozen fruits or even fruit purees and jams. Nuts & Seeds: Try them whole, try them ground or add them as a nut butter. Cooked Grains: Just because it’s quinoa oatmeal doesn’t mean we can add other grains. You can mix the quinoa with oats or amaranth or other grains. Spices: Cinnamon, cardamom, nutmeg, pumpkin spice or ginger are all great choices for breakfast. 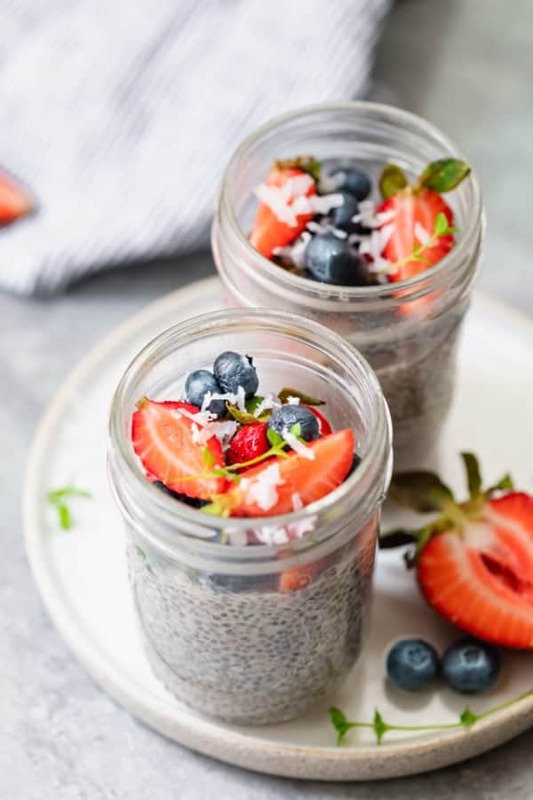 Protein Powder: If you’re using protein powders, stir it in when you’re fluffing the quinoa for best taste and consistency. 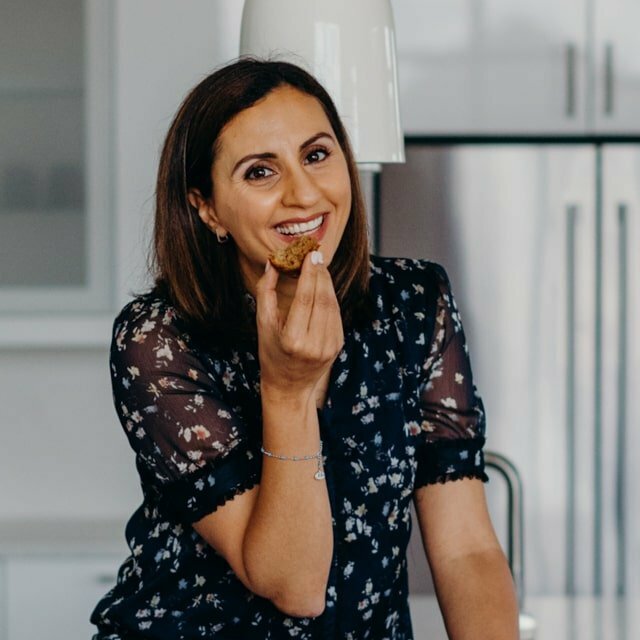 Here are four ways that I tried, which were nutritious and delicious! Blueberries with lemon zest and toasted sliced almonds. Apples with pecans, cinnamon and maple syrup. 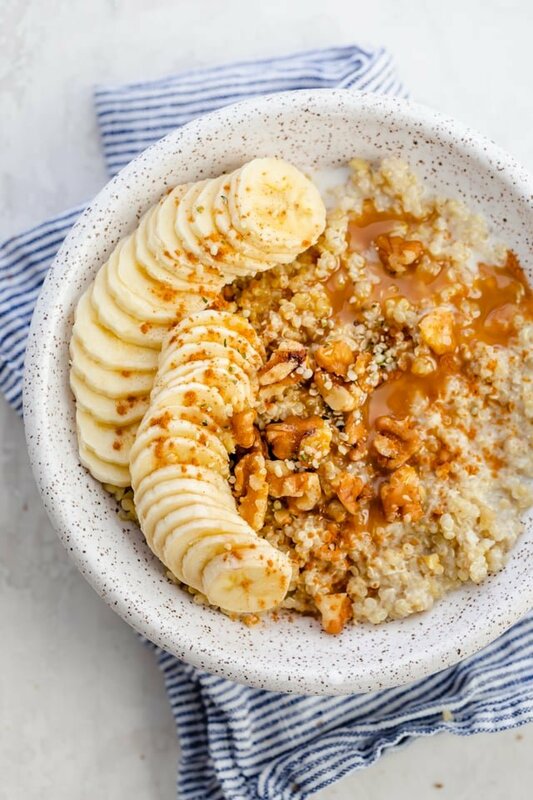 Bananas with walnuts, hemp seeds, cinnamon and caramel sauce. 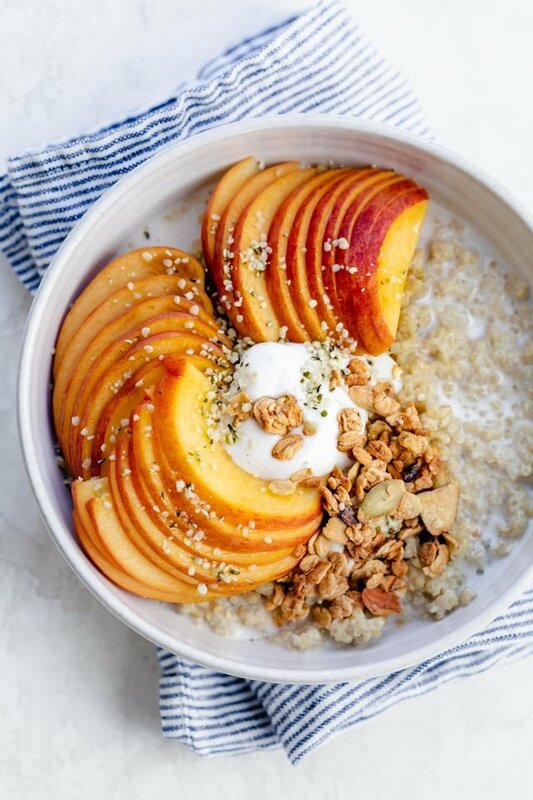 Peaches with vanilla yogurt, granola and hemp seeds. Rinse the quinoa. You might be in a hurry and feel inclined to skip this part, but I urge you not to. Boxed quinoa is usually cleaned. However quinoa has a natural [bitter] coating on the outside that helps protect it against bacteria. Rinsing the quinoa will remove this bitterness so it tastes better! Don’t forget the salt. Salt rounds out the flavor of quinoa so it’s not bland. It will help bring out the nuttiness of the quinoa. Use just a pinch or 1/8 teaspoon for one cup of quinoa. Don’t overcook the quinoa oatmeal. This can lead to a mushy consistency which we want to avoid. Instead, keep the ratio 1 cup quinoa to 2 cups milk and only cook for 15 minutes on low until the quinoa is tender. Don’t worry if the milk is not all absorbed. It will continue to thicken as it sits. Allow the quinoa to rest. This keeps it from clumping together and lets it dry out until it’s fluffy, so you’re not left with clumpy wet quinoa. 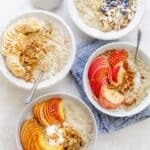 I’m a huge oatmeal fan and enjoy it in so many ways because it gives me a chance to start my day with big serving of protein, add another serving of fruit to my diet and have something warm and comforting in the morning. 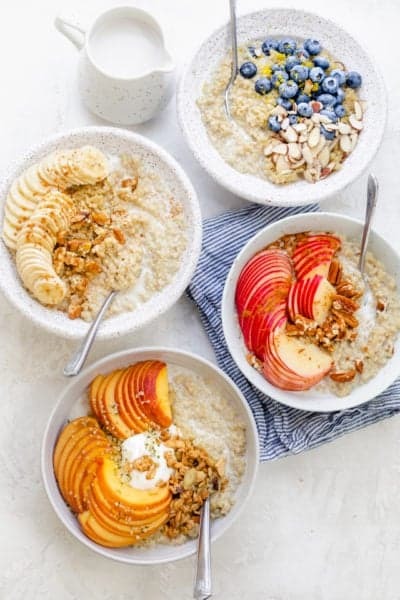 If you’ve never tried a quinoa breakfast bowl, start with my basic recipe below and explore ways to customize it to your taste! If you’ve tried this healthy-ish feel good Quinoa Oatmeal recipe or any other recipe on FeelGoodFoodie, then don’t forget to rate the recipe and leave me a comment below! I would love to hear about your experience making it. And if you snapped some shots of it, share it with me on Instagram so I can repost on my stories! In a small saucepan, add quinoa over medium heat and lightly toast it until it starts to make popping noises, about, 5-7 minutes. Stir in almond milk, maple syrup, and salt; bring to a boil. Reduce heat to a simmer, cover and cook until quinoa is tender and liquid is absorbed, about 15 minutes. Remove from heat and allow quinoa to set for 5 more minutes. In a medium microwave-safe bowl, add quinoa, milk, maple syrup and salt. Cover with a lid or plate and microwave for 6 minutes. Stir and return to the microwave and cook for 3 more minutes. Remove from the microwave and allow quinoa to set for 5 more minutes. Fluff the quinoa with a fork. 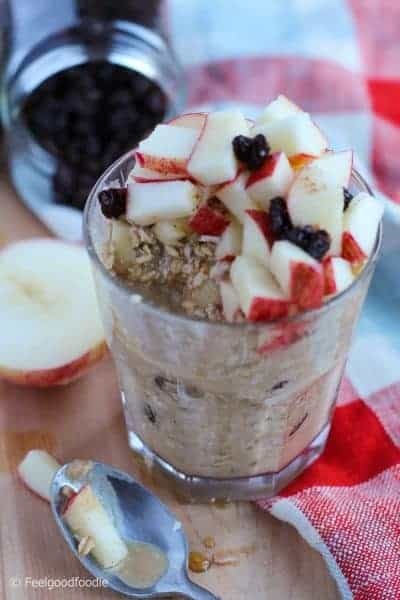 Divide into four bowls and serve as you would oatmeal with fruits and toppings of your choice. Storage: Store any leftovers in an airtight container. They will last about 5 days in the fridge. Make Ahead Tips: You can make the quinoa oatmeal in the microwave or on the stovetop in advance. To reheat, simply add a splash of milk or water and microwave for 1 minute. Substitutes: For best results, follow the recipe as is. You can also use any type of milk you'd like and any sweetener of choice.